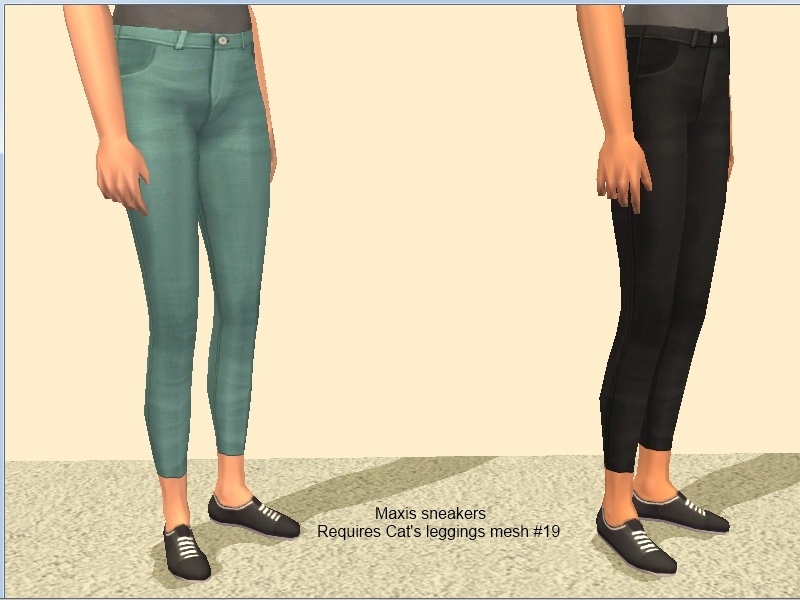 This is a mashup of Bunhead's Kokomo pants and some of Cat's leggings meshes. I got the idea for this from this set by polllinationtech, and used those pants as a template for snipping out the parts of Bunhead's textures that I wanted to use. 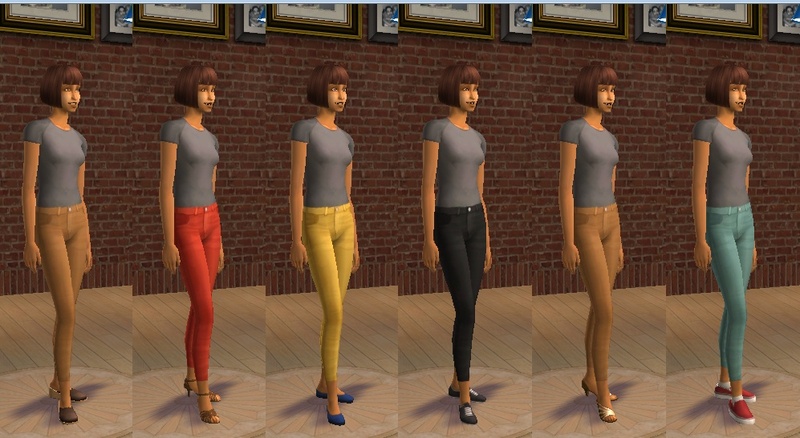 Beyond that, all I did was decide which pants to use with which shoes, and, for the flats and Vans, decide which colors to use. All credit for the textures remains with their original creators. 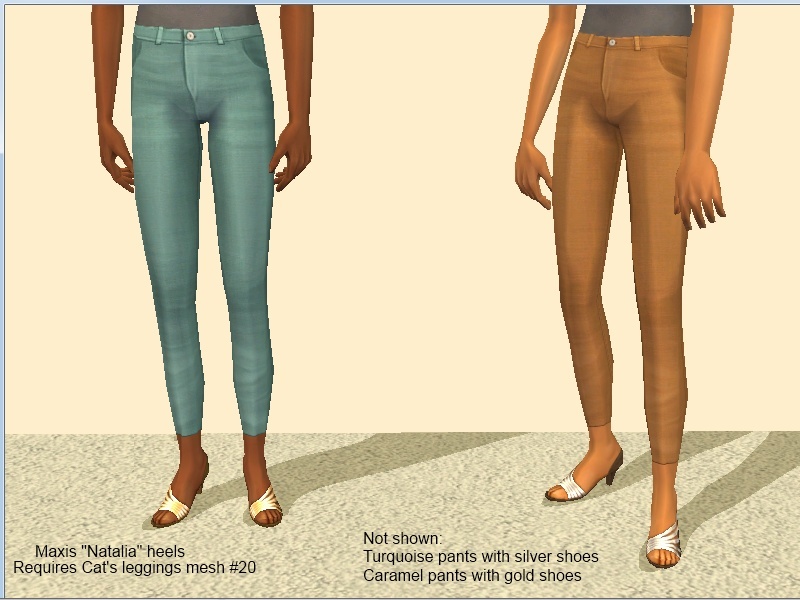 The outfits are available as Everyday for young adult and adult females, and resources are compressed. No expansion or stuff packs are required. 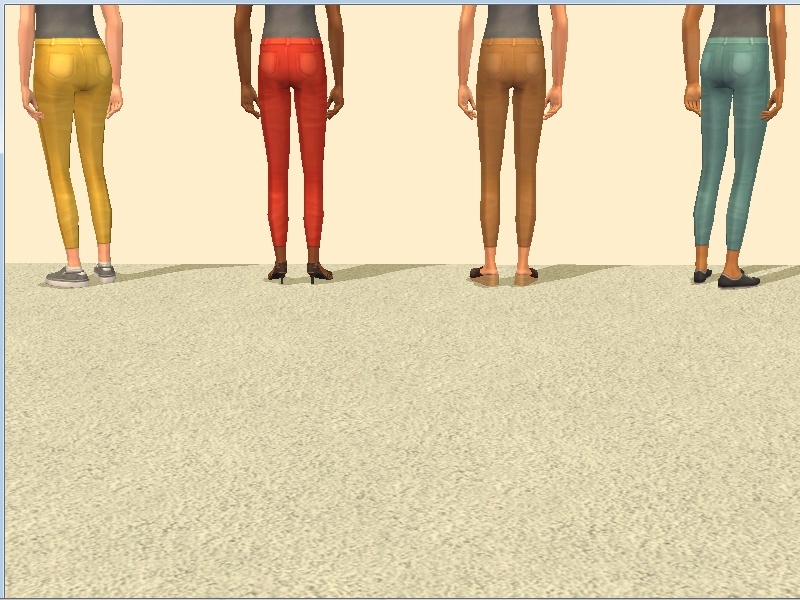 The meshes used are #16, #17, #19, #20, and #24 from this set of leggings by CatOfEvilGenius. Each mesh's packages are in a separate rar file, and each rar file's name contains the number of the mesh it uses. Per Cat's policy, the meshes are not included. If you don't already have them, you will need to download them from her thread. Mesh #16 has mule-like clogs (or are they clog-like mules?) by Cat, in brown and black; I tagged them as clogs because she did. 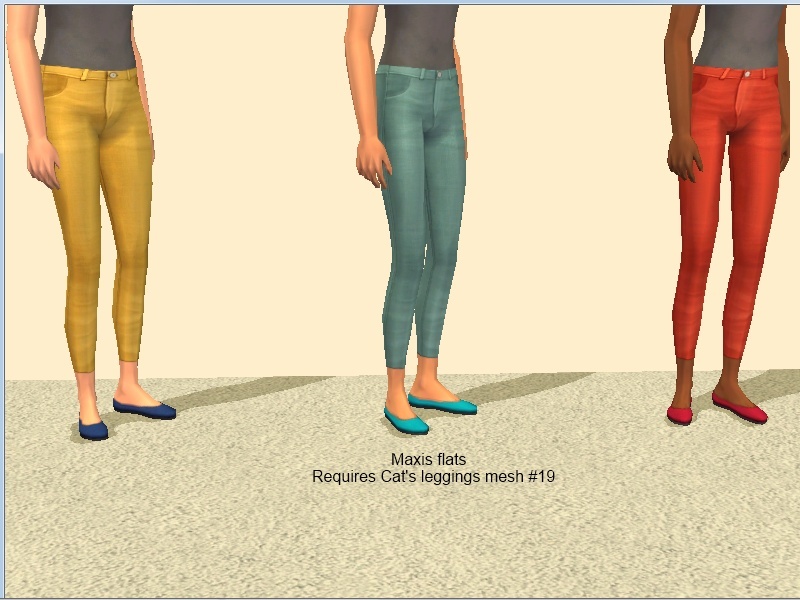 Mesh #17 has Cat's fixed version of the Toulon heels from H&M, in Maxis colors. Mesh #20 has the Natalia heels from H&M, in Maxis colors. Mesh #24 has recolors of kayleigh's slip-on Vans from GoS. Mesh #19 is a barefoot mesh, and uses what looks like an edited version of some base-game sneakers, in black, as well as some base-game flats in various colors. 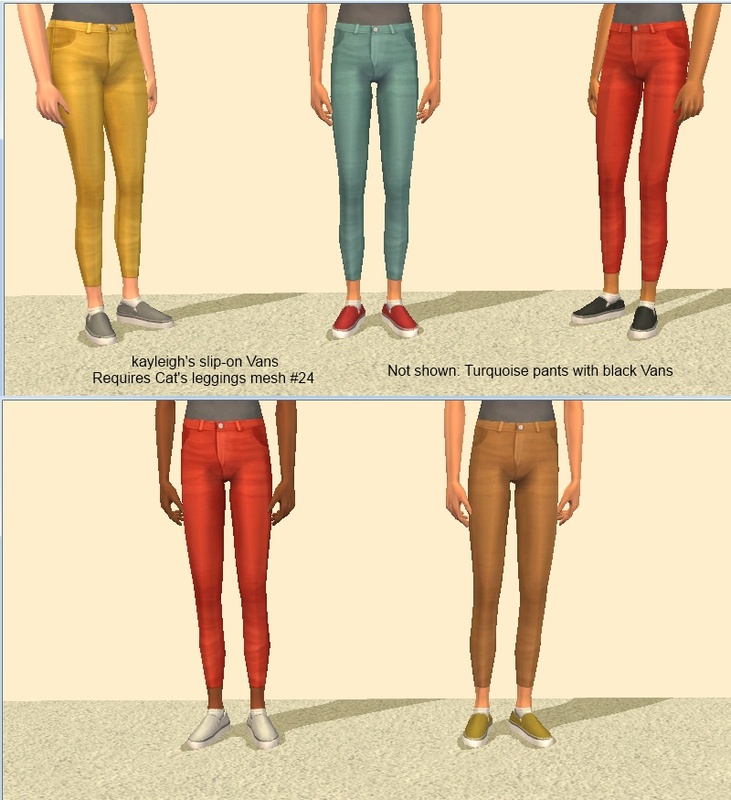 The screenshot for each shoe style shows all pants colors and shoe colors used for that style, but the screenshots do not show all available combinations of pants and shoes. 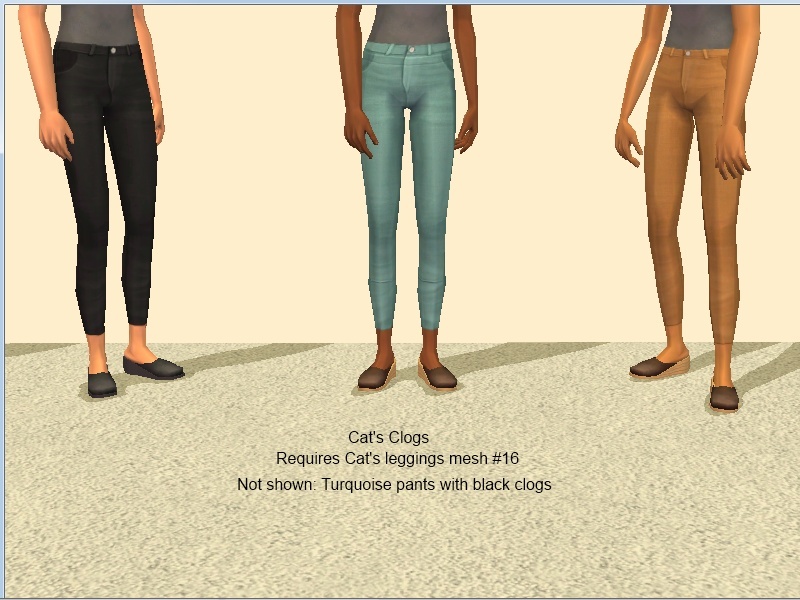 Bunhead, for the pants textures, and CatOfEvilGenius, for the meshes. 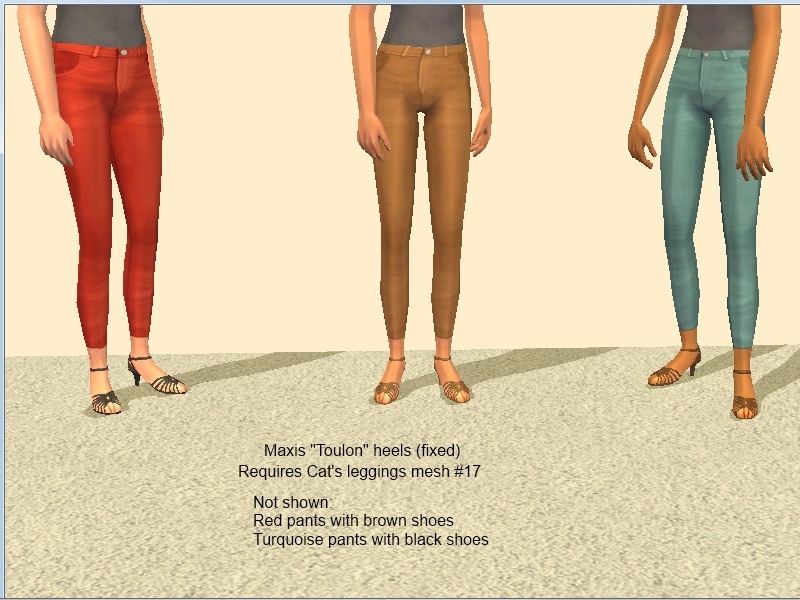 I wouldn't have known about Bunhead's pants if polllinationtech hadn't mentioned them. and I wouldn't have known about that set if DeeDee hadn't pointed to it. 23 people have said thanks to dharden for this download.